STAMFORD, CT--(Marketwired - November 02, 2016) - VantageScore Solutions, LLC, developer of the VantageScore® credit scoring model, today released a study which revealed that Americans rendered "unscoreable" and virtually shut out of mainstream sources of credit by conventional credit scoring models are nearly identical in their financial and credit behaviors to scoreable consumers with regular access to mainstream credit. The findings demonstrate that many unscoreables are not outliers at all, but rather creditworthy consumers whose access to credit is unduly restricted by the reliance on a conventional brand of credit scoring model. VantageScore analyzed a random sample of five million anonymized consumers, representative of the U.S. population, from the Experian credit bureau database. The study compared consumers whose credit files satisfied the conditions required to get a score using conventional scoring models (the 'conventional' population) with those consumers who were excluded from conventional scoring because of the status of their credit files but who had a credit history of at least one month and a public or external collection record. 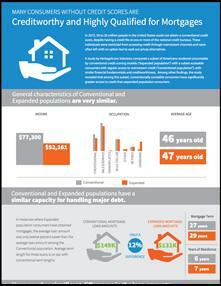 This 'expanded' population comprises consumers who meet the requirements needed to get a VantageScore 3.0 credit score. VantageScore compared the conventional and expanded populations from the perspective of credit capacity and capability, using the VantageScore 3.0 model in combination with demographic and financial data appended to the pertinent credit files. The study revealed that when that additional data was considered in conjunction with the VantageScore 3.0 credit score, the consumers included in the expanded population were as creditworthy as those consumers in the conventional population. The study found that individuals in the expanded population who scored above 620 using the VantageScore 3.0 model exhibited profiles of sufficient quality to justify mortgage loans on par with those of conventionally scoreable consumers. When a credit score is the predominant information used to assess risk, as is often the case in bankcard lending, consumers without a conventional credit score are assessed as high risk, despite the possibility that they are simply conservative users of credit with a strong financial foundations. Seventy-six percent of consumers with scores above 620 at the beginning of the two-year period maintained scores above 620 through the end of that period. Seven percent of consumers with scores below 620 at the outset raised their scores above 620 by the end of the period. Using the VantageScore 3.0 model to assess the mortgage affordability of the expanded population, 2.3 to 2.5 million -- a majority of the 3.4 million consumers categorized as potentially eligible for mortgages -- demonstrated sufficient income to support a mortgage in their geographic areas. The study confirmed that many financially stable, creditworthy individuals are excluded from access to mainstream credit under the prevailing underwriting infrastructure. 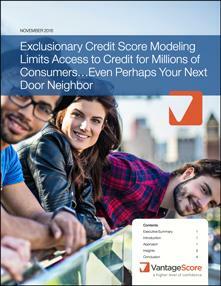 The study highlights the limitations of reliance on a conventional brand of credit scoring model within underwriting systems and highlights significant opportunities available to lenders with the flexibility to choose among competing credit scoring models, including the VantageScore 3.0 model, for use in their automated underwriting systems. "There is a longstanding perception that if consumers are conventionally unscoreable, it is because they are too high-risk to qualify for credit, or simply don't need it," said Sarah Davies, VantageScore Solutions' senior vice president of analytics, product management and research. "Our study demonstrates this assumption is false. It is a wake-up call for lenders about the need to choose their credit scoring model carefully to ensure they can 'see' all creditworthy potential borrowers. Inhibiting consumers' access to credit without seeking a holistic understanding of their creditworthiness only propagates sparse credit file conditions and conventionally unscoreable status. " Proactive lending institutions can find and engage these consumers by enhancing their underwriting processes to incorporate multiple scoring models. For more details on the study, visit www.VantageScore.com/exclusionary for the whitepaper. An infographic highlighting findings of the study is available for download at https://www.vantagescore.com/exclusionary_infographic. Credit scores can impact everything from whether you get a loan and how much you might pay in interest to whether you are able to rent an apartment. VantageScore Solutions, LLC (www.VantageScore.com) is the independently managed company that owns the intellectual property rights to the VantageScore credit scoring models, including the VantageScore 3.0 model, which scores 30-35 million consumers typically not scored by conventional models without relaxing standards. VantageScore credit scores are used by lenders, landlords, utility companies, telecom companies and many others to determine your creditworthiness. By using the VantageScore model, these enterprises have access to many more consumers, and in turn, consumers have greater access to mainstream credit. This "win-win" is due to VantageScore's innovative, highly predictive, patent-protected, tri-bureau scoring methodology that provides lenders and consumers with more consistent credit scores across all three national credit reporting companies. VantageScore is also the model tens of millions of consumers use to monitor their credit behaviors through dozens of websites and lenders who provide their users and customers with their credit scores for free. The company is celebrating its tenth anniversary in 2016. Click to download the VantageScore white paper. Click to download an infographic that summarizes the findings of the VantageScore study.